Bunk Beds Cabins ( Lower deck) Cabins with A/C, Private bathrooms with hot and cold showers, towels & toiletries and sufficient storage space. Daily Cleaning service. 2 Twin beds cabin (Main Deck), Cabins with A/C Private bathrooms with hot and cold showers, towels, toiletries and sufficient storage space. Daily Cleaning Service. The Danubio Azul is an 21m intimate tourist class diving yacht launched in August 2016, authorized by the Galapagos National Park for Naturalist and Diving Cruises. Enjoy an exceptional, safe and unique experience with a Marine Naturalist to guide you around one of the top diving destinations in the world. Traveling to some of the best dive sites in the world such as Darwin Island, Wolf Island and Marshal Cape, you'll have the chance to see rare and endemic wildlife including flightless cormorants, galapagos penguins and marine iguanas. The vast number of large pelagics and fish species will blow you away. Highlights include feeding marine iguanas or spotting the red lipped batfish, horn sharks, mola-mola or baleen whales. The Danubio Azul will take you on the dive safari adventure of a lifetime - diving in the Galapagos and visits to the islands made famous by Charles Darwin and his theories on evolution. Danubio Azul carries 10 guests in 5 comfortable double/twin cabins. On the upper deck is a double bed cabin with fantastic views. 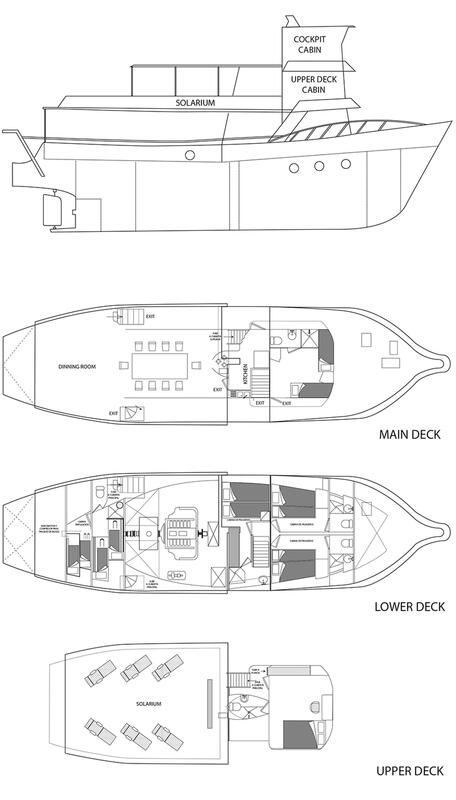 The main deck has a twin cabin and on the lower deck you will find 3 bunk bed cabins. All have air conditioning, private en-suite bathrooms with hot and cold water showers and hand basins, reading lights, bedside cabinet and mirror, 2-pin US 110 electricity sockets, bedding and luggage space. Toiletries and towels are provided; you only need to bring your personal luxury items. There is a daily cleaning service. Although the boat may appear small, it is suprisingly well planned and everywhere has a bright and fresh feeling that makes you feel welcome and at home. The upper deck is a fabulous sun deck with chaise lounges and the main deck is the galley and covered outdoor dining area. This area is normally the hub of action, with guests congregating at all times of day and night to talk and plan. In the evening, grab a drink at the bar and hear about the following days agenda. The dive deck is spacious and the captain and divemaster will consider your wishes and try to fit them in with the itinerary. The dive guides onboard speak spanish and english and the captain speaks english and italian. Danubio Azul offers different itineraries that are naturalist and/or diving based. Naturalist trips can be full week or just for either end of the weeks tour. Standard dive trips are 7 nights and have 2 full days at Wolf and Darwin Islands. Panga trips and walking tours are available on days 7 and 8. The chef is experienced in creating fabulous food to suit everyone's taste. The theme is generally international and includes fresh seafood, chicken and beef, accompanied by fresh fruit and vegetables and desserts for those with a sweet tooth. Other dietry requirements including vegetarianism can be accommodated, but make sure you mention this on your Guest Information Sheet, and have a chat to the chef when you get onboard. Tea, coffee and water are included and other soft drinks, beer, wine and spirits are available to purchase onboard.